Clair has been painting northern New Mexico ever since. “The Mayans believe the most sacred places on earth are at the foot of great mountains. I live right below Taos Mountain, and all I know is that this is my special place,” she says. “I try to be as honest as possible in my work and paint what I believe, which is that being close to nature heals, that silence heals, and that art has the capacity to uplift and bring us to a better place. “I’m sure the powers that be knew they made a mistake when they let me be born in Chicago – they just picked me up and blew me to where I belonged in the first place. I will always be grateful for that cyclone,” says Clair. 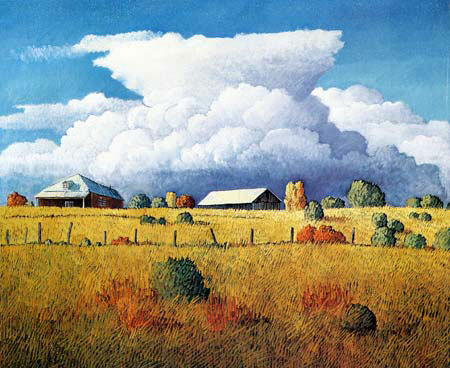 Clair is represented by Blue Rain Gallery, Taos, NM, and McLarry Fine Art, Santa Fe, NM. — Gussie Fauntleroy, Santa Fe.